Campaign for the American Reader: Pg. 99: Timothy Larsen's "John Stuart Mill: A Secular Life"
Pg. 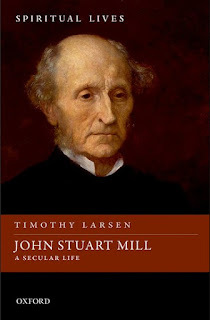 99: Timothy Larsen's "John Stuart Mill: A Secular Life"
Featured at the Page 99 Test: John Stuart Mill: A Secular Life by Timothy Larsen. John Stuart Mill observed in his Autobiography that he was a rare case in nineteenth-century Britain because he had not lost his religion but never had any. He was a freethinker from beginning to end. What is not often realized, however, is that Mill's life was nevertheless impinged upon by religion at every turn. This is true both of the close relationships that shaped him and of his own, internal thoughts. Mill was a religious sceptic, but not the kind of person which that term usually conjures up. The unexpected presence and prominence of spirituality is not only there in Mill's late, startling essay, 'Theism', in which he makes the case for hope in God and in Christ. It is everywhere--in his immediate family, his best friends, and his vision for the future. It is even there in such a seemingly unlikely place as his Logic, which repeatedly addresses religious themes. John Stuart Mill: A Secular Life is a biography which follows one of Britain's most well-respected intellectuals through all of the key moments in his life from falling in love to sitting in Parliament and beyond. It also explores his classic works including, On Liberty, Principles of Political Economy, Utilitarianism, and The Subjection of Women. In this well-researched study which offers original findings and insights, Timothy Larsen presents the Mill you never knew. The Mill that even some of his closest disciples never knew. This is John Stuart Mill, the Saint of Rationalism--a secular life and a spiritual life. The Page 99 Test: John Stuart Mill: A Secular Life.